Imported from Spain and made from carbon steel, this pan is the most common and popular paella pan in Spain and is perfect for making authentic and delicious paella. They are shallow with sloping sides that help cook the rice evenly and developing more intense flavors. The pan is thin but quite rigid and durable with a hammered dimpled bottom which distributes heat evenly and quickly while also giving it a beautiful look. The handles are made of steel and painted red. 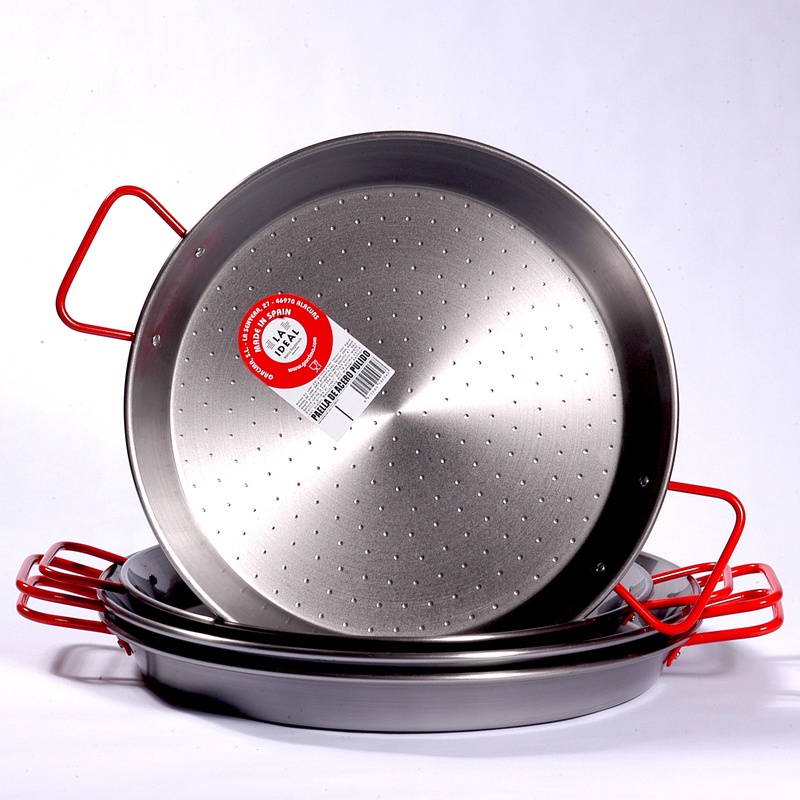 The pan can be used on a stove top, oven, gas barbeque grill, or open flame. For best results, it can be used over a paella burner (also available for purchase). As the pans get larger, they grow in diameter rather than depth, which allows for more delicious socarrat, which is the term used in Valencia to describe the delicious caramelized crunchy rice crust which forma the base of any good paella. The best heat source for a Paella Pan is one that covers the entire bottom of the pan, such as the Paella Burners we carry, which are specifically made for the job. Alternatively they can be used over an open flame (as they were originally done) or a barbeque grill. Of course they can be used on a stove top (gas, electric), however the heat source will not cook the paella evenly past certain sizes. You can overcome this by straddling the pan over two or more burners, as well as beginning the paella on the stove top, but finishing it in the oven. This will cook the paella pan but will not develop the delicious caramelized crunchy rice crust which would normally form on a paella burner. Because the bottoms are ever so slightly convex, they do not make good contact with flat surfaces and are therefore not good for ceramic or induction cook tops. If you use a paella pan over an open flame or barbeque, there is the probability that the painted handles will char and lose its color. That won’t affect the performance of the pan, just its aesthetics. Remember that the handles will also get hot during use so always use care when handling or use protective gloves. Before using a Carbon Steel Paella Pan, it should be cured and seasoned (please see the curing tab). Just like carbon steel wok, a Carbon Steel Paella pan will acquire a natural patina over time as they become seasoned and will absorb more flavors the more you use it. Just like woks however, if not taken care of properly, THEY WILL RUST. Never leave the pan to air dry without oiling it. To clean a Carbon Steel Paella Pan, simply wash it by hand with a soft non-abrasive sponge or cloth, and mild soap. Avoid washing it while it’s hot as sudden temperature changes can warp the pan. Avoid using metallic scrubbers or abrasive cleansers as it may damage the surface. If you have a stubborn food residue, use a soft-scrub sponge and dish-washing soap to clean off the residue. For especially stuck on food, put some water in the pan and slowly bring to a boil until the food is softened. Make sure to thoroughly dry the Pan, and before storing it, use a paper towel to coat with oil inside and out to keep them from rusting and store in a dry place. If rust does appear, simply wash the surface of the pan with hot water, and remove any traces of rust using steel wool if necessary and re-season. Never machine wash a Carbon Steel Paella Pan. Before using a Carbon Steel Paella Pan for the first time, you must first wash the pan lightly with hot water and a small amount of liquid detergent and a sponge to remove any manufacturing residues. Fill the pan with approximately 1 inch of water and a splash of vinegar and bring to a boil for about 3 minutes. Empty the pan, dry it carefully and use a paper towel to coat the pan with oil. Never leave the pan to air dry without oiling it. It is not really necessary to season a Paella Pan before its first use, however many people feel the coating the pan with olive oil and place it in a 350° F oven for about an hour helps begin to create the patina and prevent rust. If you love seafood, this is a great way to satisfy your craving.